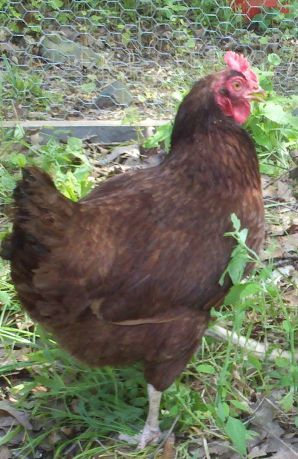 It has been about 2 years since I did an updated post about the animals of our homestead. We have gained some and lost some but we are doing our best to continue to grow. We have been living here on our homestead for 8 years now. 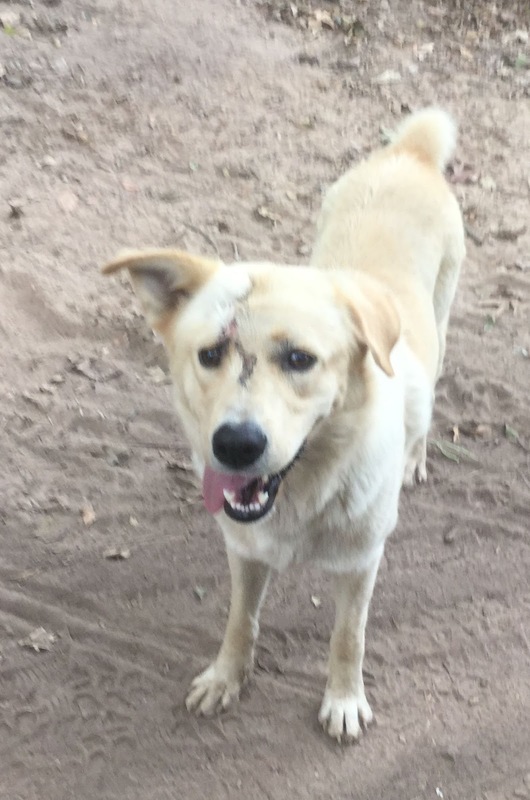 Starting out with a few dogs and living in tents to having a home and all these animals is a huge blessing. We still have far to go but the dream is coming true through lots of hard work, sweat and tears. Ronny's service dog Whitney died earlier this year and we are still heartbroken over it but Ron made a nice grave for her that we can walk to each day. 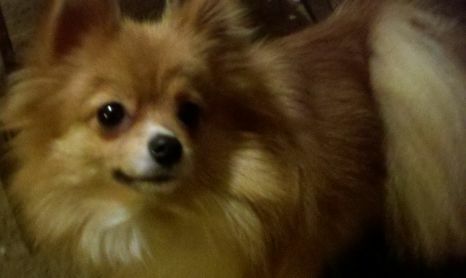 Whitney, our beloved deceased Pom. 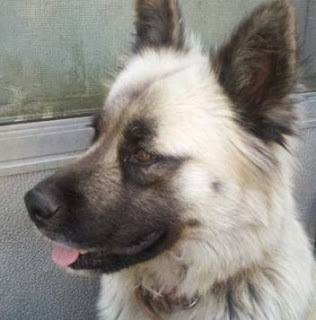 We also have 2 watch dogs: Cheddar and Sheera. Cheddar is 1 1/2 years old and is fiercely protective of us. Cheddar, our most protective guard dog. He will fight to the death to protect us and has the scars to prove it! Sheera is 8 1/2 and is getting older but still will protect our property with her life. Both are great dogs and super loving to each of us. We have one house cat too: Fred Elmo. Ronny named him as you can probably tell. We rescued him out of a shelter when he was just 12 weeks old. He is now 5. In March of 2015, we got 14 baby turkeys. We now have 7 left (3 Toms and 4 Hens). We sold 3 and ate the others. We plan on incubating some of their eggs soon to grow our flock. Yes, I know the real term for a group of turkeys is called a "rafter"but that still seems weird to me. This was a bad year for our goats. We had a lot born this year but also lost 6. We usually don't lose that many but as I said, it's been a hard year for the goats. We have a total of 18 goats now. We raise Dairy goats and meat goats and some pygmy ones to sell as pets. Our Dairy Goats are primarily Saanens. We have 7 Saanens: 3 males (Billy & Casper & Cooter who is a mini Saanen) and 4 females (Sunday, Elsa, Dainty Girl and April). Since Cooter is a blue eyed mini Saanen, we mate him with our pygmy goats. The other dairy goats we have are LaManchas and we have 3 of them. Two males: Jethro and Giblet and the female is Sweet Pea. I am thinking about breeding the males with some of our Saanens to get some different colors. LaManchas are smaller than Saanens but are good milkers nonetheless. We have 3 pygmy goats. The male is Little Moo and the females are Brownie and Daisy Mae. Brownie is a pygmy fainting goat and her daughter is Daisy Mae. We have a Nubian/Pygmy cross who is a female and her name is Gracie and her daughter Belle. 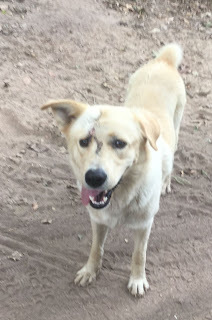 Her son is part Boer and we have not named him yet. We also have Dorkling who is pygmy cross and her daughter Midnight. We have 2 standard donkeys: Minnie & Jasper. Minnie is now 6 and Jasper is 4. We have 11 ducks. We use them for eggs and eventually for meat. We have 2 male Pekins and 6 female Pekins. 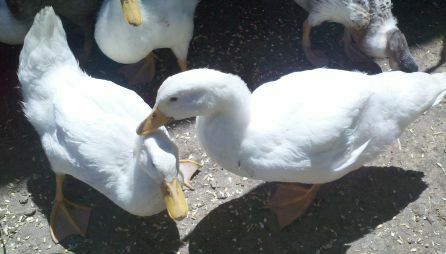 We also have 3 other ducks (1 male & 2 females). We also just got into guineas. We have 15. They are still young but I believe we have 7 males and 8 females. 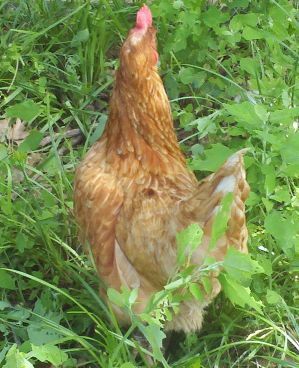 Chickens are raised for meat and eggs. We only have 40 chickens now. We have 26 hens and 14 males. We have Phoenix, Rhode Island Reds, Red Rangers, Freedom Rangers, and Ameracaunas. 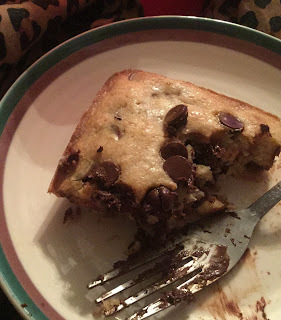 This is an easy dessert and while it doesn't turn out super pretty, it does taste delicious. 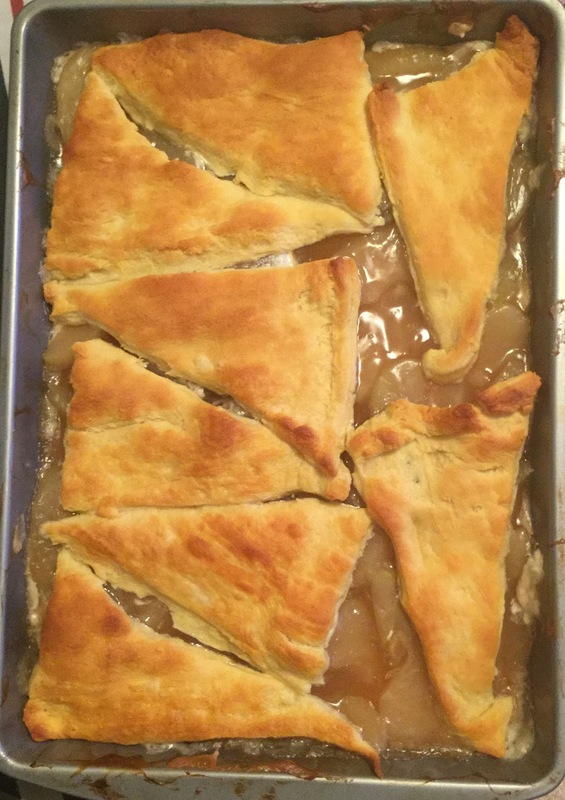 The flaky layers of crescent rolls along with the sweetness of the apples is a great combination. Preheat your oven to 375. Spray a 9"x13"cake pan. 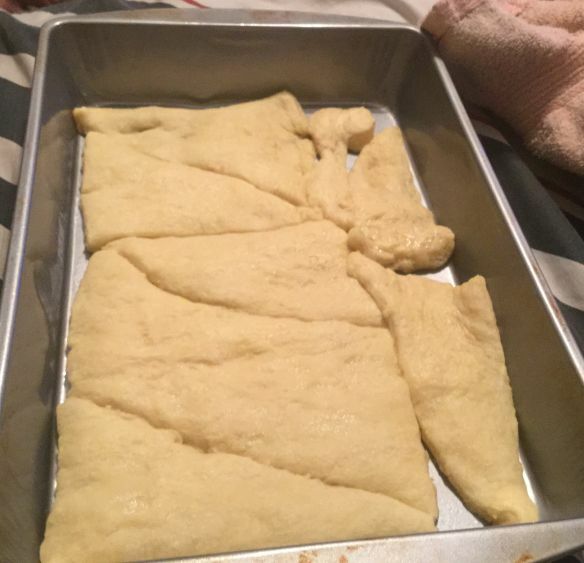 Take one package of crescent rolls and spread and flatten them out into the bottom of the cake pan. Put the pan in the oven and bake for 2 1/2 minutes. 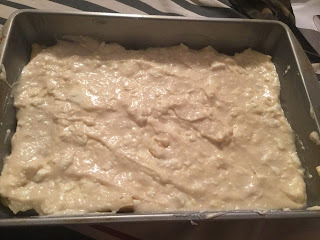 This will ensure that once the filling is added, the bottom will be done, otherwise the bottom layer will still be doughy. 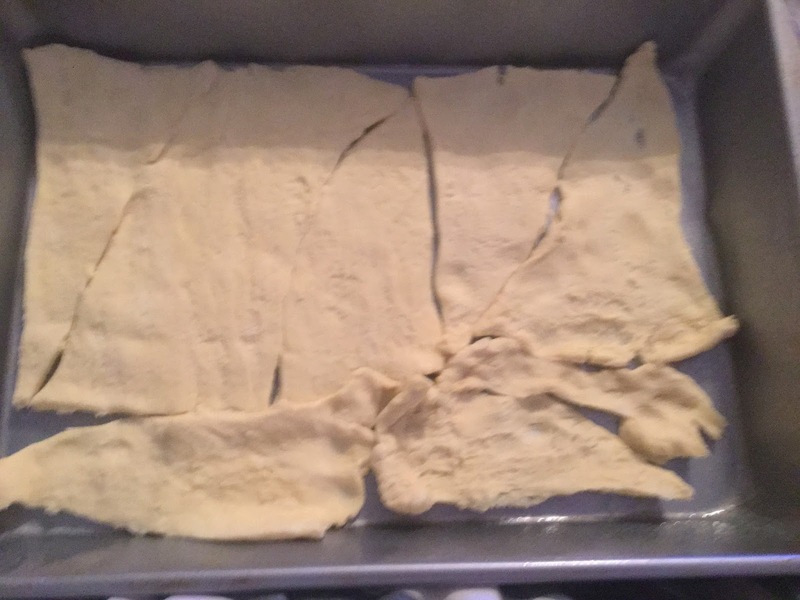 As you can tell in the above photo, the dough is not done but has raised some. This is how you want it to look. Now, take the cream cheese and blend it real good. Then stir in the powdered sugar and the vanilla. 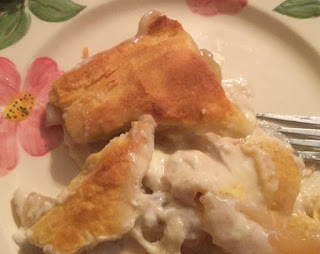 Spread this mixture onto the partially baked crescent rolls. 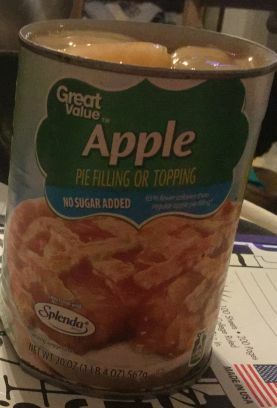 Open your cans of pie fillings. 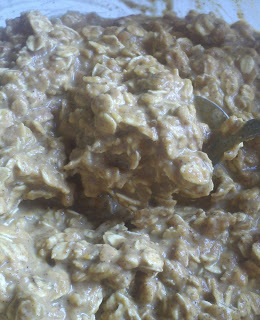 Pour both cans of pie filling on top of the cream cheese mixture. 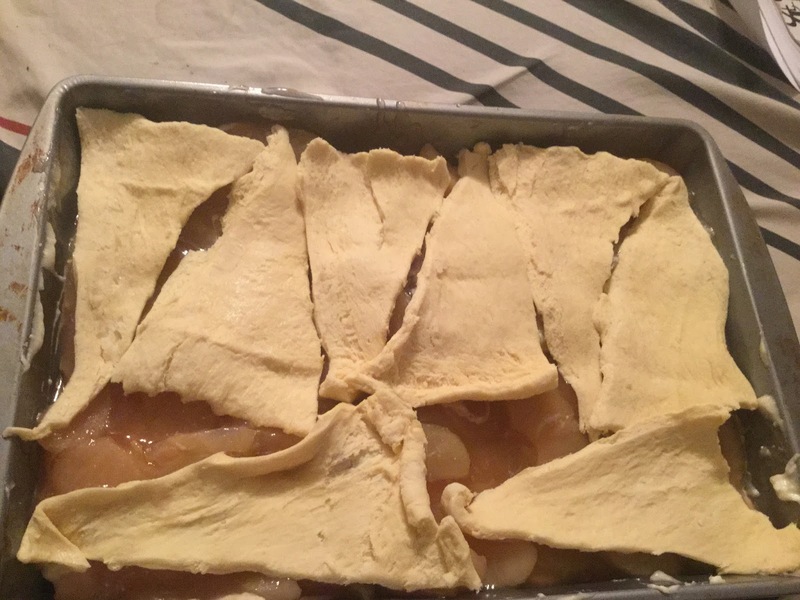 Open up the other can of crescent rolls and place on top of the pie filling. Other recipes I make using apples include: Super Easy Apple Pie and Country Apple Bread. My youngest son is autistic and loves being covered up. At night, when he goes to sleep, he wears a heavy robe and then has us layer about 10 blankets on top of him. This is true of winter AND summer. It is comforting to him. 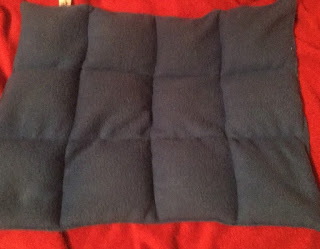 The weight gives him a sense of calm and that is true to a lot of autistic children or people with sensory issues. 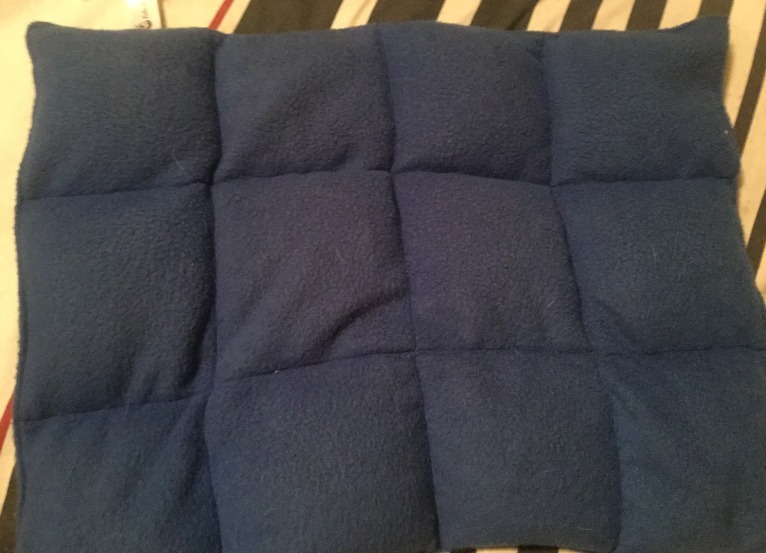 I wanted to get him a weighted blanket to see if it could help him. I purchased one and we used it for Ronny for about 2 weeks and noticed a difference. When Ronny is having a meltdown, I drape the blanket across his lap or over his shoulder and it helps him. 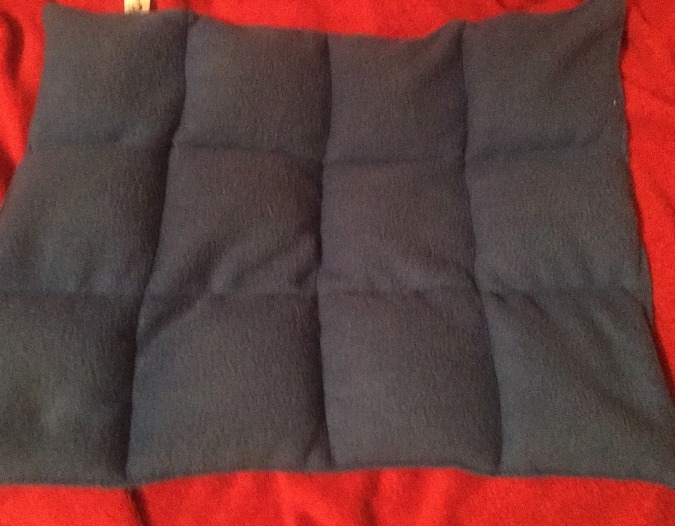 It is said to help his brain produce serotonin, via the deep pressure and touch stimulation the blanket provides, and then the serotonin helps calm the mind and body. At night, the same pressure releases serotonin and in turn has the body produce melatonin which helps induce sleep. Regardless of the reasons why it works, I just can say it does work for Ronny. If you know someone with sensory issues or difficulty in handling situations or sleep issues, I recommend trying a weighted blanket. It is a good alternative. Cut the lime into wedges (I cut mine into 4). 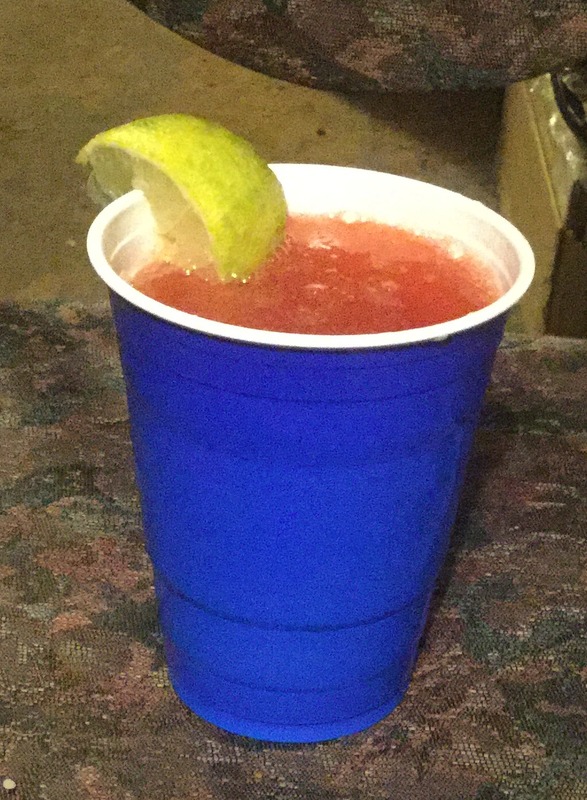 Take one wedge and squeeze it into a glass. Be sure to squeeze most of the juice out of it. 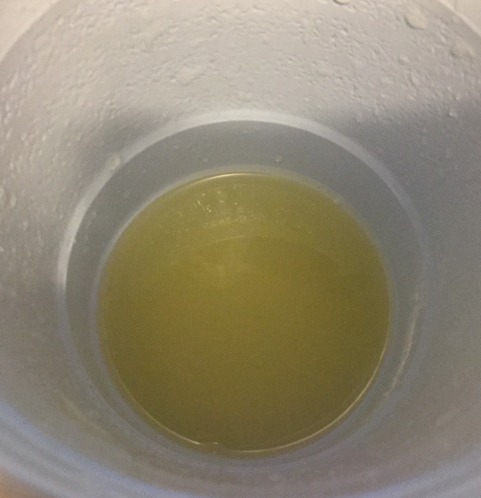 Lime juice in the cup. Once it is squeezed drop the wedge into the glass. Now put in 2 of the Maraschino cherries. 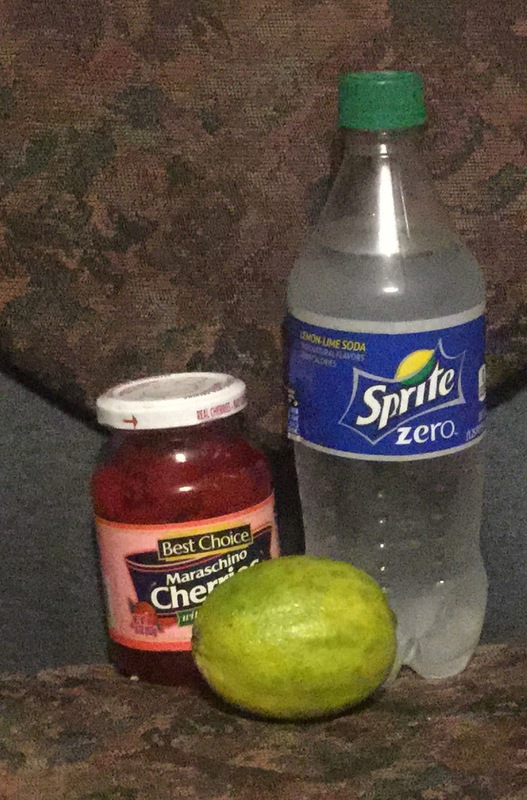 Pour in the Sprite until it is almost full. Now pour in 3 T. of the red liquid that is in the Maraschino Cherry jar. Take another lime wedge and squeeze some more juice into the glass. 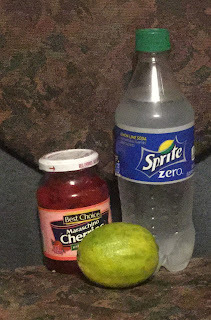 Place that lime wedge on the edge of the glass. Gently swirl the contents of the glass (just a little, not much). Now enjoy!!!! 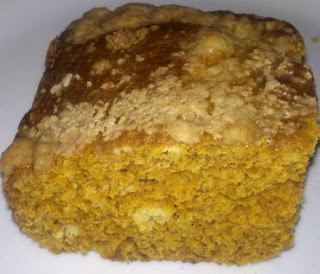 First up, my Pumpkin Flavored Coffee Cake. 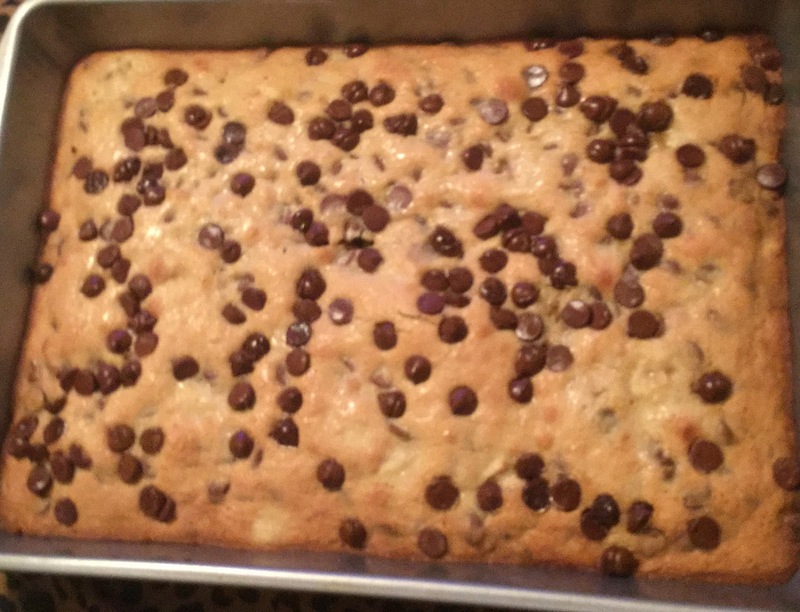 Super yummy and goes great with a cup of coffee! 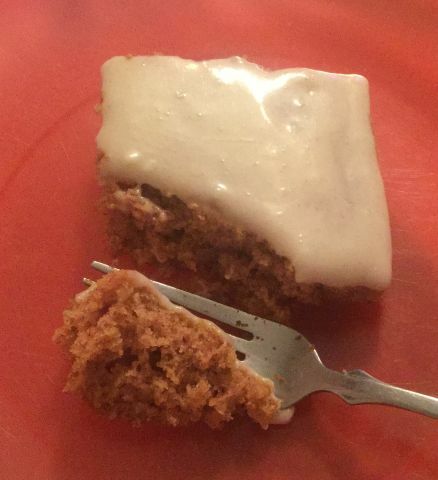 One of our favorites is a Pumpkin Sheet Cake. 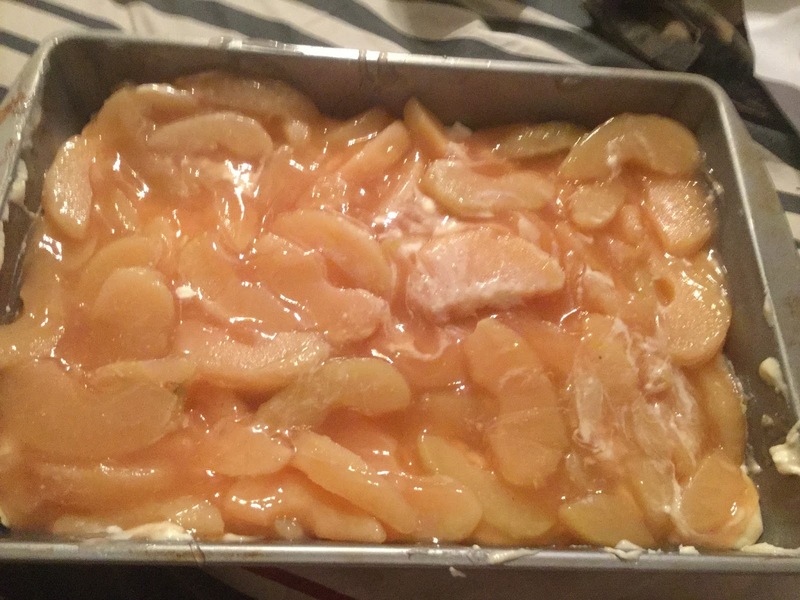 Oh, my, is it delicious and you can make it in under an hour! Want something even better? 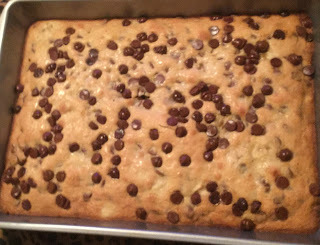 How about my Pumpkin Chocolate Chip Coffee Cake? Man, oh, man. It is good! So good you could eat it every day and never tire of it! 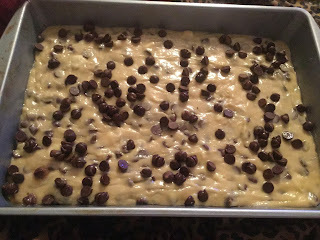 The batter for my Pumpkin Chocolate Chip Coffee Cake. Doesn't it look good? Pumpkin Pie in a Bowl makes for a very filling and yummy breakfast. Perfect for cold days. 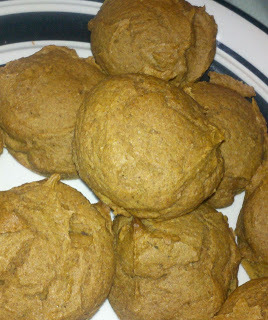 Pumpkin Muffins are another good Pumpkin recipe for breakfast or makes a nice after school snack. 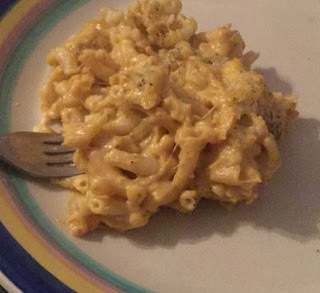 If you crave something savory, try out Pumpkin Flavored Macaroni & Cheese. I know it sounds odd but it really tastes nice and is a good change from the norm. 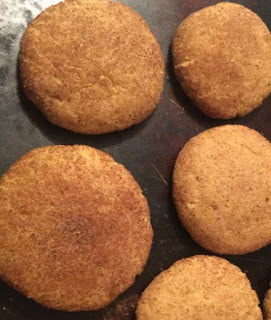 Snickerdoodles is one of my hubbies favorite kinds of cookies and he is obsessed with pumpkin so I combined the two to make Pumpkin Snickerdoodles. I know when most people think of Pumpkin Pie they think of Thanksgiving but I believe Pumpkin Pie is yummy enough to have any time of the year. I saved the best for last. 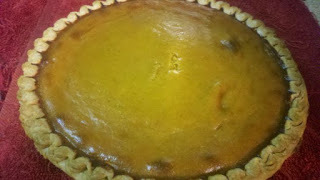 This elevates the traditional Pumpkin Pie to a WHOLE NEW LEVEL. 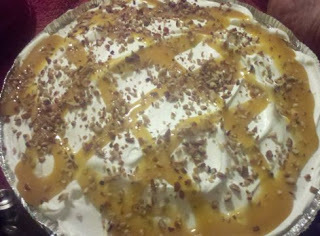 Decadent, beautiful and delicious is the only way to describe my Pumpkin Supreme Pie! I hope you enjoyed having all these recipes in one place. The sign on the side of the building! Oh, my goodness! 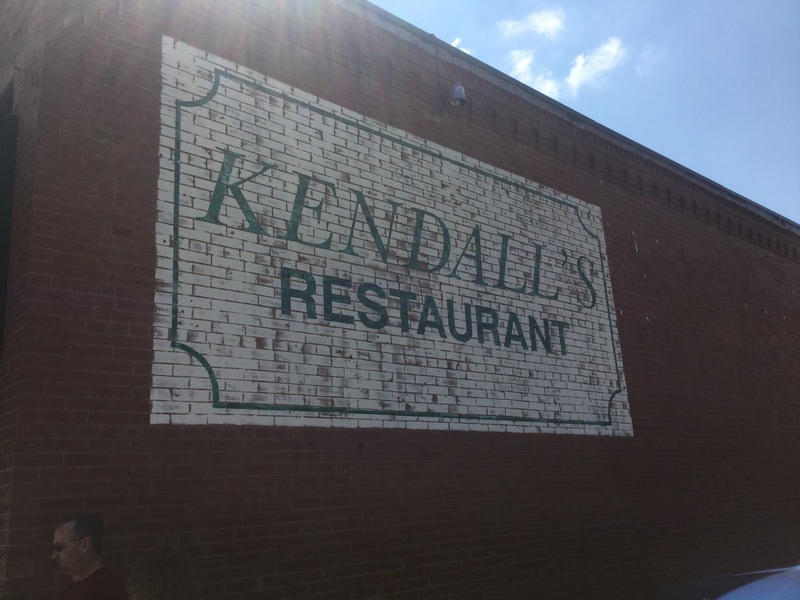 I had the GREAT pleasure in reviewing Kendall's Restaurant. Kendall's is located in lovely Noble, Oklahoma and is known far and wide for the Chicken Fried Steak Challenge. The boys sitting on a bench out front enjoying the view. To give you an idea of the size of chicken fried steak you get for the challenge, check out the photo below. 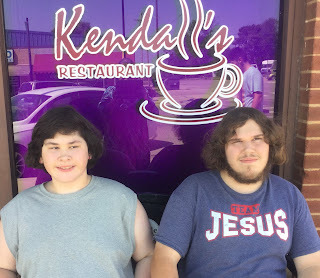 We did not do the challenge but we did eat a "regular" chicken fried steak and believe me, it is the largest CFS I have ever attempted to eat. Their regular sized steak is about twice as big as most peoples. Not only is the steak big but it is so good. No fat or gristle in any of it. The coating is crisp and the steak is tender. Even under all the gravy, the coating stayed crisp. This is Bub's meal. I know it may not look huge here but keep in mind that they serve your food on dinner PLATTERS. 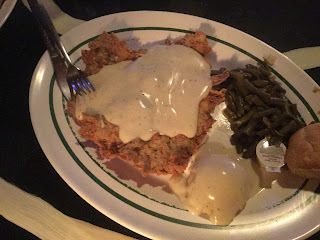 The chicken fried steak can be compared to a 9" pie plate. Look at the fork in the upper left hand side. That is a normal sized fork so that will give you an idea on how big they are. The mashed potatoes are creamy and smooth and their gravy is seasoned perfect. I could almost drink the gravy it is so good. All the food is good ole southern comfort food at its finest. Their rolls are nice and fluffy. Everything we ate was delicious!!! I have watched it a few times because I find it all so interesting. 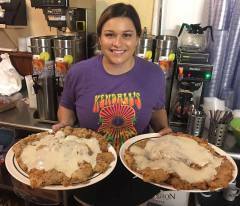 The Chicken Fried Steak Challenge includes the massive steak but also veggies, etc. As you heard in the video they have about 100 people a MONTH try the challenge and only 35 people have EVER completed it. Out of probably 10,000 people who have tried it...only 35 but if you are one of the ones who complete it, you go up on the "Wall of Fame". Also if you fail to complete the Chicken Fried Steak Challenge you take home the leftovers in the "Quitter Box". 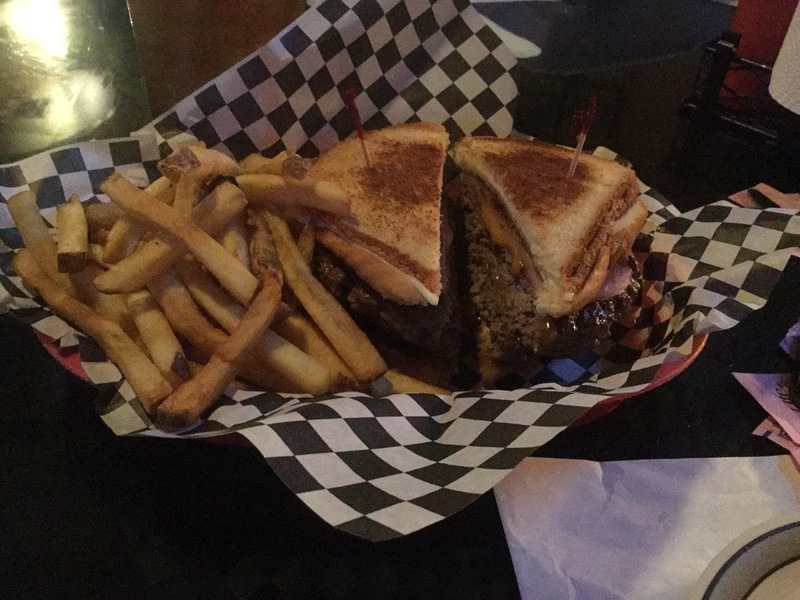 We live about 3 1/2 hours away from Noble, OK but the food was worth the drive. The restaurant has a World Map on the wall with a push pin marking the location of people who have come to taste their food. As you can see, it is an impressive array. I can see why people would visit from far and wide. The atmosphere is nice and the walls are decorated with nostalgia. The people are down home and friendly. While we were there, we even seen Kim (the co-owner) bussing the tables. They are just generally good people with no airs about them at all. About everything they make there is done by hand. No fancy machinery. Just people doing the real work. They make cinnamon rolls from scratch and about any time you drop by there will be an employee rolling out the dough and making them. They had just prepared a batch right before we left. Don't they look yummy? 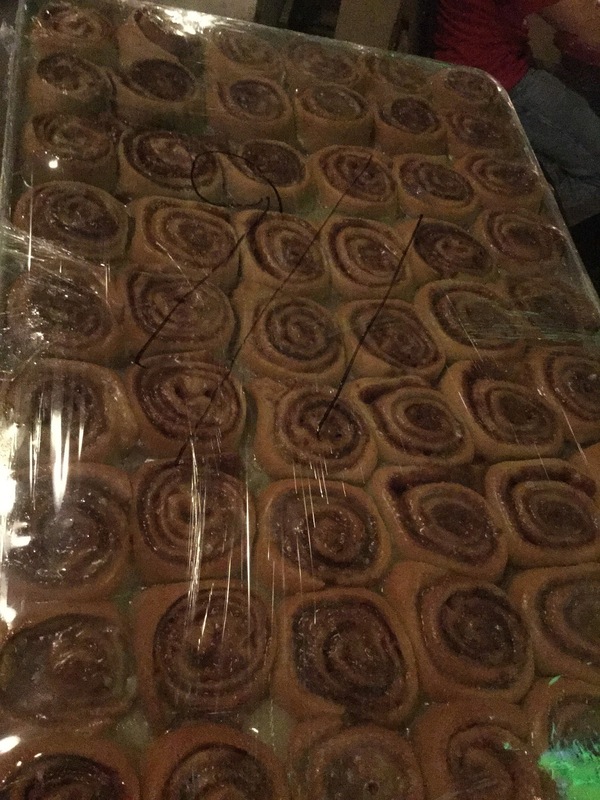 Some of the cinnamon rolls they make each day by hand. 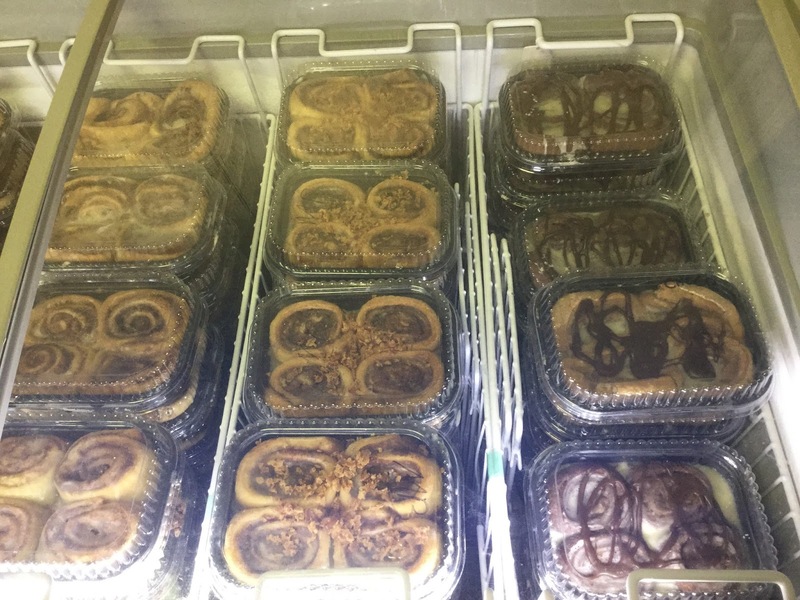 Before you go, you can even buy some cinnamon rolls to take home with you. They have Pumpkin flavor, regular, Maple Bacon, or Chocolate. 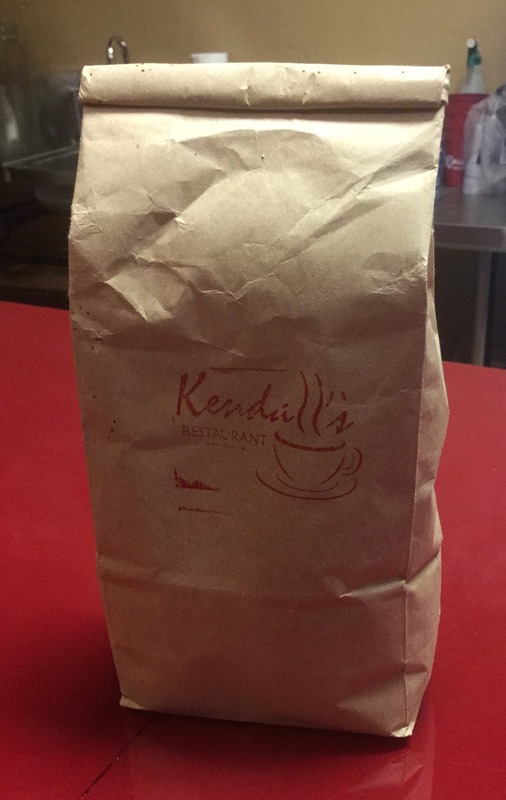 You can buy a package of 4 for just $5.00. We bought a few a package of chocolate and had them the next morning for breakfast. We took them from the freezer, threw them in the microwave for 2 minutes and they tasted as fresh as if they had just been made! They also have their own signature coffee. We got a pound of it and Ron says it is the best and smoothest coffee he has EVER had in his life. He said we'll have to drive back sometime just to purchase some more. I have no problem going back but for me, I would go back to get a burger. I went on and on about their Chicken Fried Steak and yes, it was DELICIOUS but we ordered a "Widowmaker" burger to take home with us and late that night, I had a bite of it before going to bed and almost died right there. Oh wow! By far, that is the BEST burger I have EVER tasted in my life. Not sure what they do different or if it's the meat they purchase but it was glorious. It is also huge and I let Ron and the boys and my Mother-in Law all have some of it and they all agreed with me. 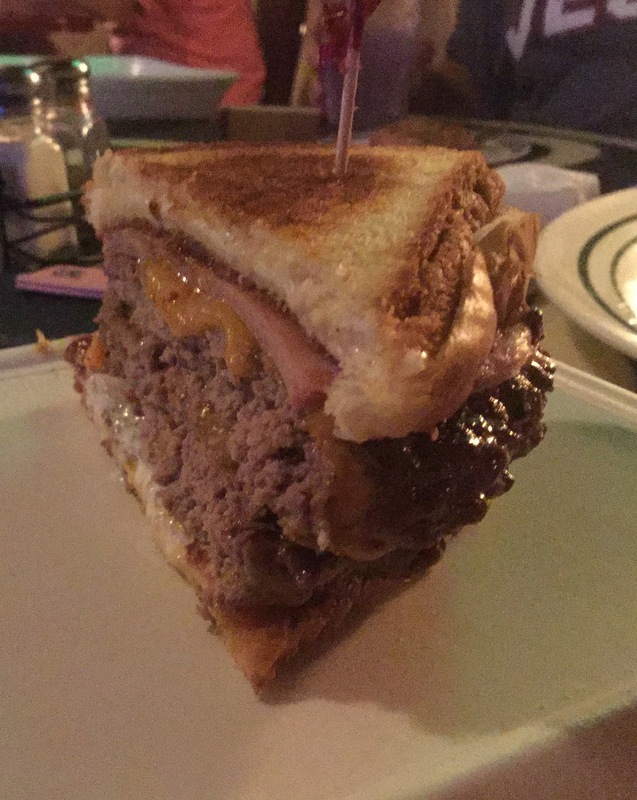 That burger ALONE is worth a 3 1/2 hour car ride. 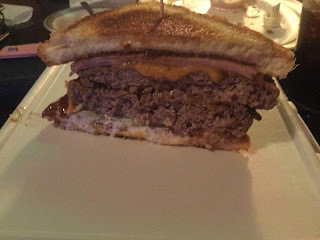 The "buns" are grilled cheese sandwiches and a LOT of great meat and some ham and cheese too! Yum! Look how thick this beauty is! Please, if you are EVER in the area, drop by you will NOT be disappointed. Drop by and tell Kim "hi" and let her know you heard about her from us here at "Countrified Hicks". They are great people with GREAT food! Be sure to check them out on Facebook or their website. 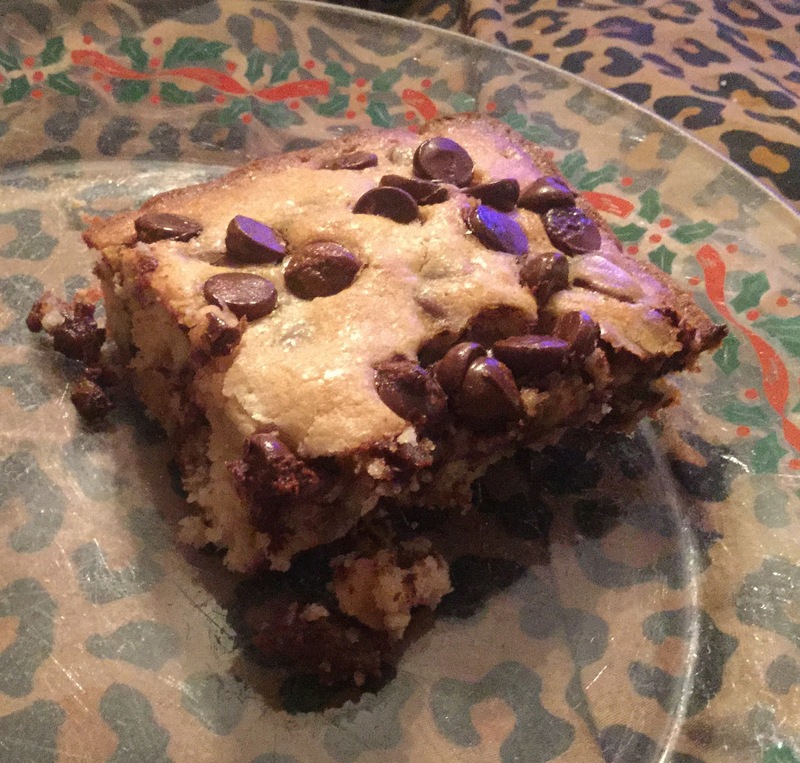 Sometimes I just don't have the time to make chocolate chips cookies but the family wants them so the solution to both our dilemmas is to make these Chunk Chocolate Chip Bars. 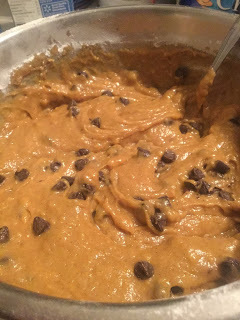 Just mix them up, spread them in the pan and no need to make individual cookies! Preheat your oven to 350 degrees. Spray a 9"x13" cake pan with cooking spray. Set aside. In a large bowl, mix together the butter, eggs, sugars, salt and vanilla until well blended. Add in the flour and applesauce. Once it is mixed well, fold in the chocolate chips. 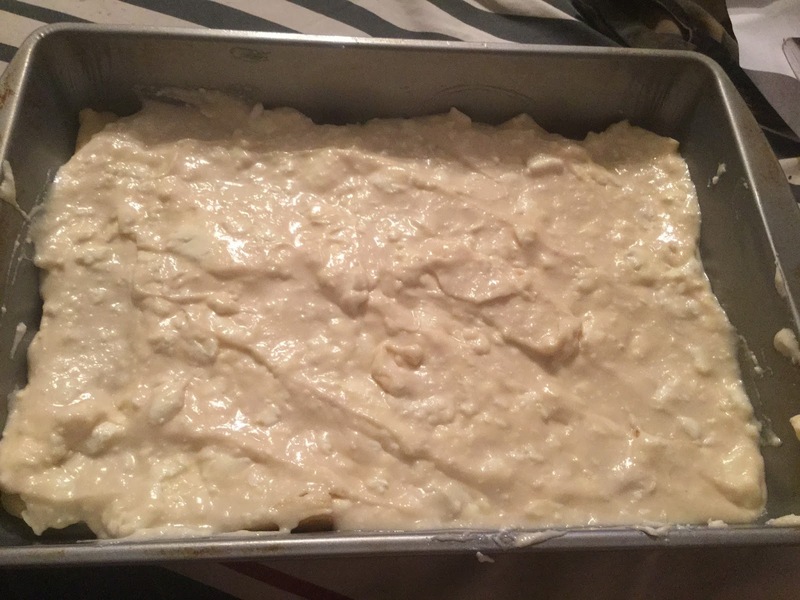 Spread the mixture into the cake pan. 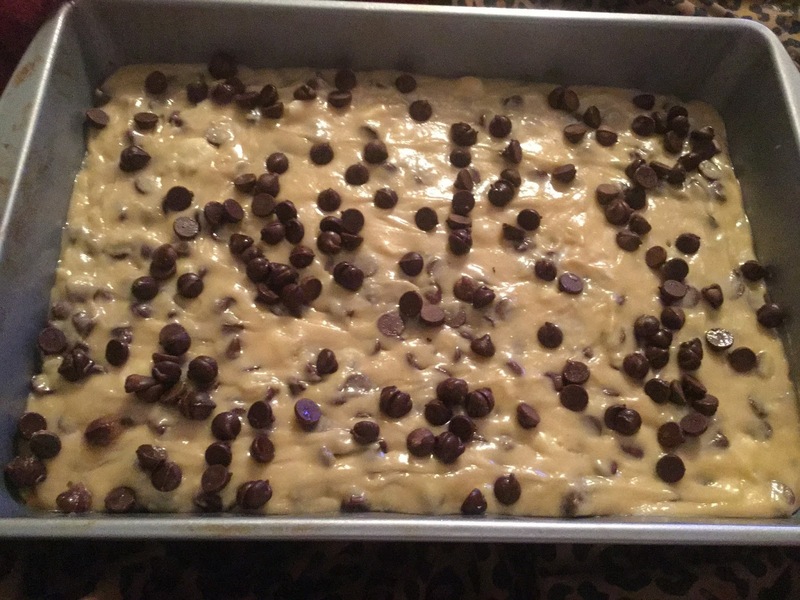 Take the 1/4 cup of chocolate chips and sprinkle them on top of the batter. 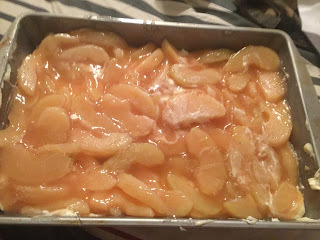 Bake for 35 minutes, until it is just lightly browned and a toothpick inserted in center comes out clean.